For my whole life, I've heard teary-eyed talks about how America was really unique for "the peaceful transfer of power." Especially at election time or Scout Jamborees or, I dunno, DAR meetings, that sort of nebulous phrase is professed and repeated and written on blackboards as though it were the mathematical proof for American Exceptionalism. As a kid I always thought it was stupid, so today I'm going to define the concept as best I can then test it. The "peaceful transfer of power" thing was and is phrased a lot of different ways. I remember my 70 year-old Scoutmaster once saying that America is the only country in the world that peacefully transfers power (from president to president every four or eight years, in our case). He very generally and very wrongly talked about other countries always having to fight wars or kill somebody before a new head of state is allowed to take the reins. Well, no; that would be unusual in the fifteenth-century Ottoman Empire but not in the modern world or the vast majority of world history. Succession is not that difficult. But that's the most extreme version of the "peaceful transfer" myth I've heard. My Scoutmaster was terrific but sort of insane. He fought in the Korean War, but I would never ask him to lecture on Korea or the Cold War or anything that requires a working knowledge of history and geopolitics. Speaking of, here's a version of the myth I remember from my 8th grade history textbook: "The 1800 US election in which Thomas Jefferson defeated John Adams was the first time in history that power peacefully transferred from one group [sometimes they say "party" instead of "group"] to another without bloodshed." You know this is in textbooks because you can find a bunch of kids asking this question on various quick answers websites to do their homework for them. This claim is also significantly overreaching the facts. Dynasties should count as the same "group" remaining in power, but there are plenty of times in history that one dynasty was peacefully replaced by a new one. To use some easy, high-school history book-level examples, Elizabeth the Great was the last Tudor monarch in England, and when she died she was replaced by James VI of Scotland, the first king of a new dynasty called the Stuarts, and he brought basically his entire Scottish government down to London with him. A century later in England you get the Glorious Revolution, which was famously bloodless. I'm not going to pretend it was the norm, but bloodless transfers of power from one group to another are not tremendously unusual. But what if we want to talk about the first peaceful transfer of power between "parties" rather than simply "groups"? Well first of all that wouldn't be tremendously impressive given that we don't really call anything anywhere a "political party" before the late eighteenth century. You have families as in Florence or Venice or you have factions as in ancient Greece but we don't call them "parties," not for any real difference so much as it just not being the applied word at the time. Then second, in 1762 a Tory replaced a Whig as Prime Minister of Great Britain. I doubt they thought of Whigs and Tories as political parties for another few decades, but that's what they were, and power transferred between them several times between then and our 1800 American election. Doubtless some people would argue that the king was still holding the real power in Great Britain rather than the Prime Minister, but they'd find themselves defending a poor example because George III was famously insane and not given an awful lot of actual power. 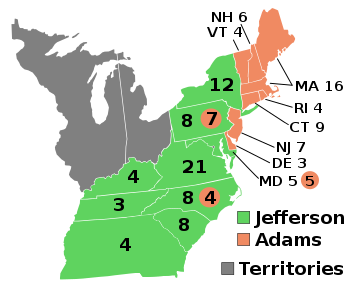 Jefferson replacing Adams was a fairly unique and notable occurrence, but more because of America's rather new and somewhat experimental form of government than anything claimed about the peaceful transfer of power. It is slightly rare in history to find peaceful transfer of power between groups while the former ruler was still alive (if I add any more qualifiers this sentence is going to cave in). It does the 1800 election a disservice by attempting to make up fake facts about this special event. But there's yet another version of the myth, the one someone writes glowingly about every inauguration: America has the longest streak of consecutive peaceful transfers of power in the world, going back to either 1789 or 1797 depending on your definition. Dylan Matthews covered this in sort of a misleading way last month at Wonkblog. He includes a graph ranking current streaks based on the number of peaceful power transitions, which is going to favor parliamentary systems like Italy's which switch primi a thousand times like my picky nonna Eugenia (boom!). Most people want a streak of years rather than transfers, which would reflect a bit better on the United States except for another thing Matthews didn't cover: The US had a Civil War over an election! South Carolina seceded from the union in direct response to Abraham Lincoln's election in 1860, leading to a giant war that's still the bloodiest conflict in American history. How can you possibly call that a peaceful transfer of power? Because in the end Lincoln prevailed (only to be shot and killed anyway)? If the American Civil War counts as a peaceful transfer of power, then it's not a phrase worth glorifying. Okay, so let's say we're up to 147 years of peaceful transfers of power now. Is that special? Yes, that's a remarkably long time, but still not the longest nor the longest active streak. Great Britain/The United Kingdom still has us beat because their last contested transfer of power was the Glorious Revolution in 1688 (bloodless, but it involved an army I suppose so I wouldn't necessarily call it peaceful). They also have the US beat in only having one assassination of a Prime Minister against four US Presidents. Without having done any actual research of any of that stuff, I'm going to guess that the Republic of Venice had the longest historical streak of peaceful transfers of power. The Venetian Republic lasted from the 700s AD to the time of Napoleon, a thousand years of bizarre and complicated elections. A failed coup by Marino Faliero in 1354 is the most obvious spot on their record, and that still leaves them with 400+ years of peaceful elections on either end.